The Stencil Surprised Me on Day 4 of Stencil Week! Welcome to day 4 of Stencil Week! Play is so very important to me and for more than just the fun. I learn when I play. Learning that only happens when I let the paint take me where it will take me. I was playing around making some tags as colorful organizers for on my Clip It Up . Just playing around not knowing where it would go. WOW! It took me to a whole new place all because I don’t like to clean! 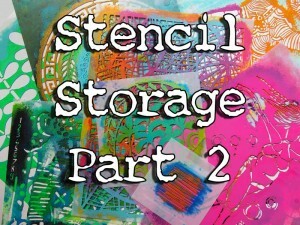 I’m also over on StencilGirl Talk today showing some very very ingenious ways to store stencils! 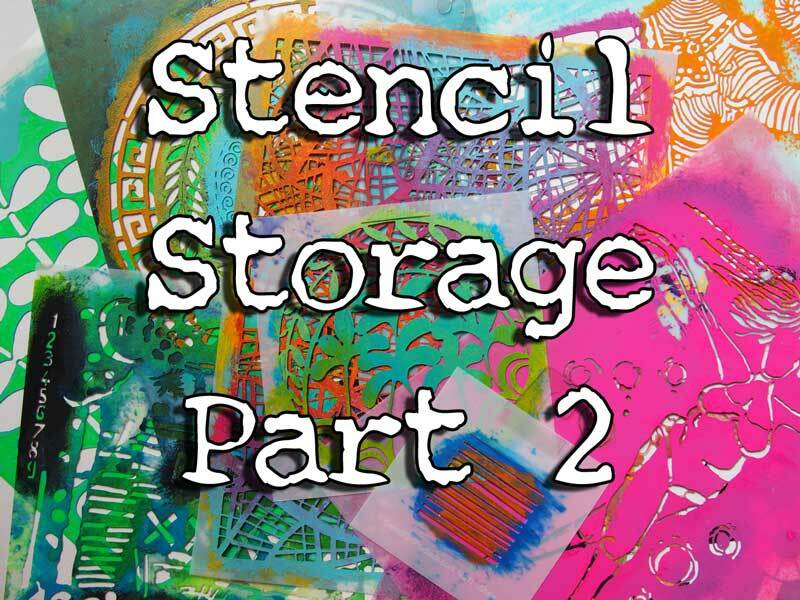 Click here for Stencil Storage Part 2. In a previous post you can see how I store my stencils. Click here for part 1 also know as The Tale of Goldilocks and her Stencil Storage. Click here to watch An Unexpected Way to Use and Clean a Stencil on YouTube. Want to win a Union Small Stencil that I used in this project? I am giving away one of these stencils to a randomly selected winner! But that is not all! I am also giving away 3 sets of J Hooks (40 hooks per person) to 3 other winners so 4 giveaways in all today!! To be entered all you need to do is leave a comment telling me one supply or technique that you wish you were more comfortable using. Want another chance to win? Just share it (Facebook, Google Plus, Pinterest, Twitter, etc.) and come back and leave another comment telling me where you shared it! 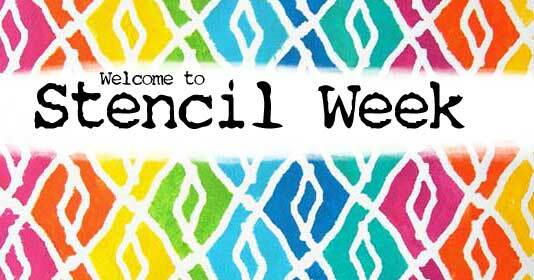 I’ll be announcing all the randomly selected winners from Stencil Week next Friday, Jan. 31st. right here. Be sure to be entered before random.org picks the winners for your chance to win! And yes, international folks are eligible too! Love this stencil, like all the rest. Cleaning…hummmm sometimes I guess it’s a good idea. I still struggle with spray inks and paints used with stencils. Rarely get the outcome I was going for. Can’t get to grips with using pastels…….. Perhaps it’s the dust? I loved this video! Fortunately I don’t use many heavy body paints so I don’t have to wash my stencils…yet! Some of them are quite colorful, though. 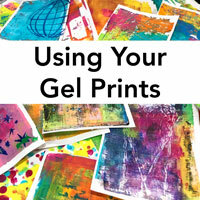 I wish I knew even more ways to use the Gelli plate. A little rubbing alcohol does miracles in the stencil cleaning department! i love the spray inks but i just cant use them right. they either come out in a big gush or get under the stencil and make a puddly mess. so id like to be able to create great backgrounds with those. I wish I was more comfortable with drawing over my gelli prints, I’m not confident with my drawing and I’m always afraid I will mess up the beautiful prints! Great stencil! Image transfer has always been my most difficult technique. Perhaps I’m impatient…but more often than not I muck them up and have to have several goes to get a decent image. I wish I was more confident using acrylics, the bold colours scare me! I find getting clear/crisp images with stamps a problem. Must be my technique! BTW… Thanks for the great videos this week (and always)! 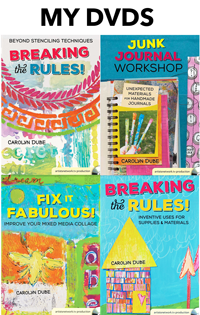 I love your bold colors and your philosophy “no measure, smudges oh well!,etc”. This is what I am trying to get more comfortable with. You know what? It is fun!!!! So freeing and it really does unleash creativity. Thank you !!! Still new to stencils, so it is very much a learning process for me. I do realize that practice makes perfect; need to find more “play” time! Wanting to learn watercolors this year. Starting slow! Not so much using supplies, but combining different media … I wish I felt more comfortable with layering. I find that the one art supply that challenges me the most I do have some fair amount of control over, I just simply cannot STAND the way it sounds and feels on the paper, and that is standard pastels. I have tried so many different textures of paper with my pastels and they stay dry and almost chalk on chalkboard irritating to me to the touch. I can blend them and love their colors and the softer lines that I can achieve, and I maintain a disdain for using them that makes them the least used thing in my craft room. I use the zyron sticker maker more, and that’s just sad, really. I love to play with them all. Great stencil! Spray inks – they always puddle for me!! Thanks for making the “sacrifice” of cleaning your stencil! I died laughing!! =D You are too funny!! Actually I only have a few stencils (more since I have started watching you), but they are not something I use very often. Having said that I need a design for a page I am working on so I am going to search my limited stencil stash and see if I can find the perfect background. Using the j hooks to store the stencils – brilliant!! Spray inks can be challenging. I need to get better at using the “right” amount. Loved the stencil storage tips! Thanks. Love playing with the stencils, but still coming up with mud with paints. GRRRRR!!! Bummer…you still cleaned it! I thought you stumbled on a way to transfer the paint with packing tape (similar to removing dry paint from a gelli plate). Loved the storage idea for the stencils! I want/need to learn more about Gesso — how and when to use it, and why. I know YOU can make this easy to understand and show me ways to PLAY with it. Thanks! I shared this video on Facebook. I pinned this to my “Art – Stencils” board on Pinterest. Another fabulous video and project! learning so much! Let’s see… an item that I wish I was more comfortable using… Large Canvases for Mixed Media. They scare the heck out of me… because they are so large! I have a hard time visualizing what the completed piece will look like! So in a way, I am also afraid to be FREE when creating. I have shared on Facebook… https://www.facebook.com/sara.ament1 , Pinned on Pinterest… http://www.pinterest.com/eternalprincess/giveaways/ , and Shared on Google +… https://plus.google.com/102789472928485959308/posts . when i first looked at your new stencils, the union was my favorite. and it even looks great in green, a color i usually avoid but seem to be liking better now that i am using it a bit more. I wish that I was more comfortable using oil pastels with or without a stencil. Had to laugh at your not so clean, gunked up stencil…so me. If you draw my name for the J hooks…please draw again. I have absolutely NO space to hang my stencils but would do it in a heart beat if I had the space. As usual, a terrific video. I could listen to you all day! But now I have to go in my studio and actually be productive. Another great and INSPIRING video, Carolyn. Do you sleep? The green tag was 3D to me cuz of the randomness of it all… totally LOVED that effect!! I wish I could to photo transfer better. I have tried soooo many times, using photo paper, magazine paper, but to no avail. Either more of the image lifts as I rub the backing off, or it just plain sticks. I’ve seen some beautiful work and wish I could do the same… envy. Shared on FB, G+, and Pinterest. Thanks for having the buttons handy dandy for us to share your creativeness, really, REALLY appreciate that!!! Understanding the wide variety of uses for different mediums – eg:- gel medium, matt medium, gloss gel medium, acrylic gloss gel, large grain gel this list continues! Love those tags! My PC is running slow today and I can’t get YouTube to work but I’ll definitely bookmark and be back for that video. great ideas…i think I’m getting motivated to organize!!! Woo Hoo!!! Shared on all but Tweeter! Another fun video, Carolyn, thank you. I’d love to know how to create a dark background with acrylics – mine always end up looking a dark mess! I’m at work right now so I don’t have access to videos but I will go home and watch yours tonight. One thing I would like to try is black gesso. It looks daunting so I have stayed away. Thanks for the chance. Thanks for another great video and more ideas!! I bought a finger nail brush that I use to help me clean up painty gunky stencils. Thanks for all the chances in your fun giveaways! I just wish there was an easy way to unclog spray misters. And it’s always the one I particularly wanted to use that’s the problem. I wish I were more comfortable with my drawing skills, especially faces! I’d love to add them to my work, but they often end up looking off kilter so I need to practice them more! And that is why I always clean my stencils after I use them. 🙂 Great video, the stencilled tags look great. I struggle with so many techniques, I suppose I’d pick sprays, I always end up with too much ink on my project. What a great stencil. Thanks so much for these great videos. I haven’t really figured out spray inks yet. Can I just say how much I enjoy your videos! You are so real world – so normal! I have a few stencils I need to go soak! :) Thank you so much for all your inspiration!!! I love the storage idea for stencils and the tags you made to separate them. 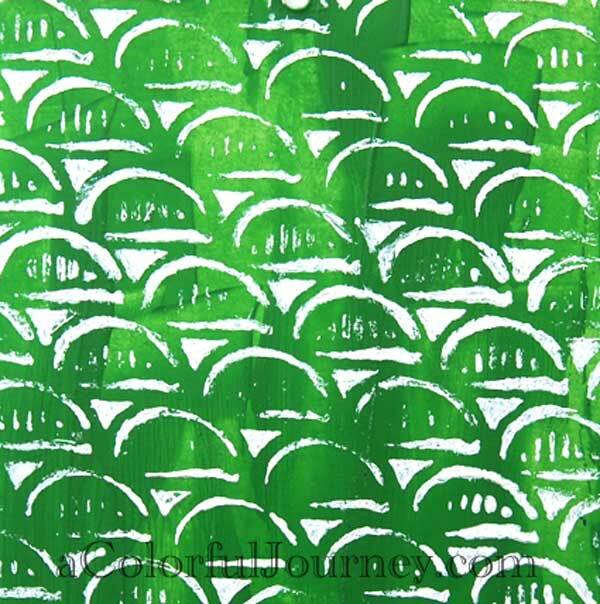 Although I have made some interesting prints with my gelli plate they are still all very random. I would love a tutorial on how to make prints in a more planned way so that the result would be a recognizable picture of e.g. a landscape. Hope I’m making sense. Anyway, thanks for the chance to win the stencil/J hooks. This has been a fun week so far! That is hilarious! I think I need to not clean my stencils more often 😉 I wish I was more comfortable (read better at) with layering my projects. Love the tags, also thanks for sharing.. and I to am not patient I to just want to get the paint on. Every time someone on my favorite blogs discovers another product I get it and then it sits. Just found all the equipment for embossing metal from Ten Second Studio. I love the stuff but just can’t figure out how to incorporate it with my journal/paint/stencil stuff I’m doing. Any suggestions? Love the way your storing your stencils. I’m a neat freak so keep a small dish tub with water in it when I stencil with paint and just throw them in when I’m done. Works for me. Love the union stencil! And I want some J hooks. Pens make me freeze up — I worry more about messing up with them than anything else. I’m so glad to hear you say you don’t clean as you go and that you let your stencil soak for hours— It makes me feel less pressure with regards to cleaning the stencils I have. It seems to take more time than the projects so this helps a lot. I love all the storage ideas. I think that would work better than how I have them in a binder. Gonna have to think about how to incorporate the ideas into my space. This was a great help. I just fb and pinned too. Love all your new stencils! Would love to win one. I wish I was more comfortable using my melting pot. I have watched a million tutorials, etc. but for some reason I avoid it like the plague. I even took an encaustic class in person with Dina Wakely and was very unsure of the result. I think if I used it more rather than avoid it I might become more comfortable and be able to make lots of embellies and do encaustic pieces. OK I convinced myself?? Great video. My solution for cleaning stencils is to sit in the edge of the tub, press the stencil against the edge where it’s flat and use a sponge or soft brush to get most of the paint off. One supply I find more challenging to use are distress stains. I would love to use them with stencils but they are so liquid I have mixed results. I find it difficult to use stencils and spray ink as the ink seems to seep through the stencil too much. I love your stencils and think you are pretty awesome too! I need to get more comfortable making canvases as a medium to work on – I love the freedom of art journaling but to do a canvas is a little more intimidating for me! As an embracer of the imperfect I love the way the tag turned out from the ‘gunked’ up stencil – looks awesome! is a fantastic stencil, thanks for this amazing opportunity to win! I am enjoying your video’s, watching you play has opened my creativity! Thanks so much! I love all of your videos. Thanks for a give away!!! Great video, I wish I knew how to use distress stains a little better. Great video – the one technique I wish I was more comfortable using is working with my own handwriting! Some people have great hand-writing – mine is loopy and goofy. Need to stop judging it and just accept. I didn’t realize that acrylic would bubble up like that if you soaked it long enough. Great tip! Thank you! I love techniques and not too many scare me…. what I’m not good at is just letting go and going… that’s what I need to work on. Thanks for the chance to win!!! Another great one Carolyn. I don’t clean either, too busy using! Love those serendipitous surprises! I would love to learn how to do transfers with acrylic mediums or paints – I am not sure where to start with them. Wow, you actually cleaned a stencil! That’s a first! LOL My problem is getting started with a project. I watch all kinds of videos, think about what I want to do, then feel overwhelmed and don’t know where to start. I ordered things for organizing and I never clean my stencils. What is the paint brush you use? And could you direct me to a video where you actually paint the way you say you are supposed to? Mind you, I like how my things look and I use a sponge. I can’t always feel my fingers or hands and it is easier this way. I love your videos and share things you post. I tweeted it again today! Having come from Day 5 – it’s amazing how colors can change the look of a project. Having not worked with stencils before (I have some but haven’t gotten them out to work with) I would have to say that is something I’ll be uncomfortable with until I get my feet wet. thanks for all of the ideas. Shared on Pinterest! Great video! 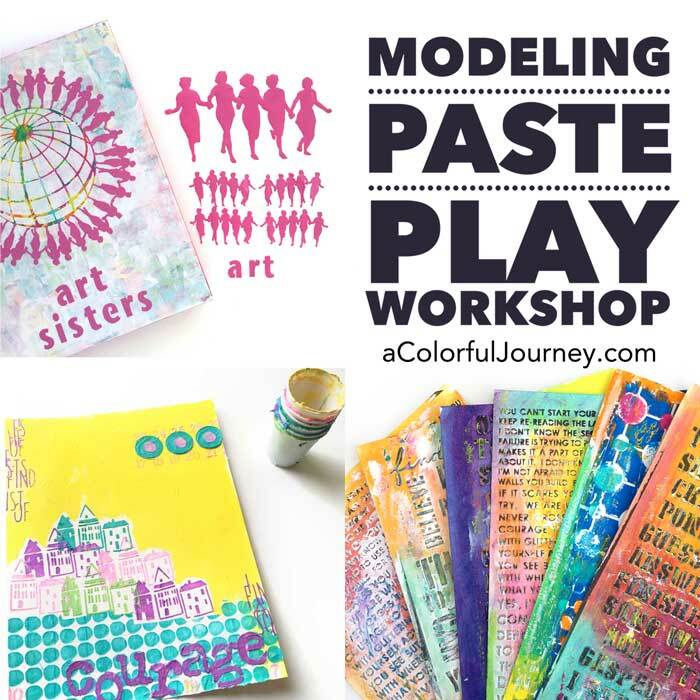 I would like to become more efficient at using the Gelli Plate….it seems to elude me as to how to get something good going on it. I don’t use my chalks/pastels. Don’t know what to do with them, and don’t like the fact that there is so much “dust” that needs to be sealed. BTW…LOVING your videos this week! I wish I was more comfortable with a) water colors, and b) drawing/sketching with pens! 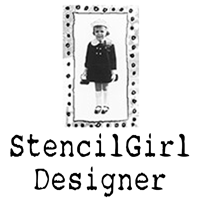 Carolyn, it’s Friday evening and I went back and posted all 5 of the stencil week videos on my Facebook page. I love your work and really learn a lot watching your videos – that’s why I subscribe to your channel. 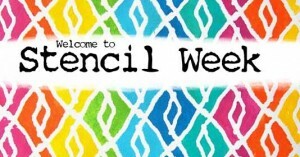 And I really want to win one of the stencils this week. The last thing I won was a stuffed dog at the school fake when I was in 7th grade (1962). I think I am due! Thank you for sharing your work. I wish I was better with Pan Pastels. I keep rubbing the foam off the tools…. I haven’t gotten comfortable with making my own stamps. I’ve watched videos and read tutorials on it but just haven’t tried yet. Your stencil cleaning habit/method is smart and a huge time saver! I am not comfortable with shading. I know it is more of a technique rather than a tool but I would love to use my stencils as a shading tool. Got any ideas?! Stencil week has been a blast! Thank you for all the wonderful new stencils and inspiration. 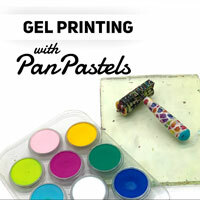 I don’t use the gelli plate much and I wish I felt more comfortable with that. Spray inks! I feel they have a lot of potential that I haven’t quite tapped:) Thanks so much for sharing your tips and techniques, Carolyn. Gesso…it just doesn’t do it for me! First time seeing one of your videos. Always enjoy watching and learning. I would like to learn/do more collage. I’m toooooo controlled… yes, I even clean my stencils. 😮 Liking on FB. Love that “Union” stencil! I’m really, really new to mixed media…need to learn everything! Thanks for a week of great vids. I’d love to win that stencil; glad to see it in action. I’d like to get more comfortable with image transfers. I tend not to do them because they intimidate me. I have learned to be more relaxed (thank goodness) while being creative but still don’t like messing with the creamy style pastels. I end up with an horrendous mess all over me, smudged all over the journal page and end up ripping it out in frustration. (doesn’t sound very relaxed does it LOL). 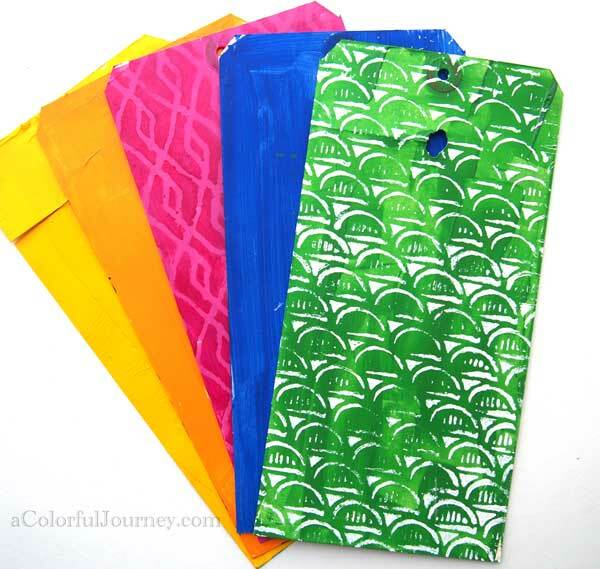 As much as I love the stencils, I am keeping my fingers crossed for some j-hooks as they are impossible to find here in Australia. As always, fun fab video. The technique I tend to struggle the most with is layering. I start and like what I have and am affraid of ruiing it, some people have a problem stpping ones started, I wish I had that problem. I love color washes but I always get a dry throat when I use it. Never fails. Ick! Enjoyed watching this – and what nifty dividers for your stencil storage! I, too, love your videos. Thank you for your generous sharing. Like Sara said, large canvases scare me. Also, as others have said, spray inks–I want to love them, need to do more experimenting with them. I’m a newbie, so I need info on just about everything. But I’ll try to be specific – I’d love info on spraying on stencils–have some Lindy’s Stamp Gang & Ranger Ink sprays but haven’t tried on stencils because it seems like it will just seep underneath! 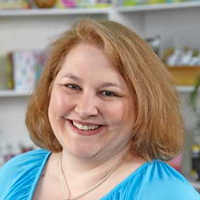 Ok – going to poke around on your blog some more now – go glad I found you!